The Real Story Behind "Free Range Chicken"
1. What is "Free Range?" Free Range means the birds are free to range outside, to scratch the ground and forage on plants. Contrary to perception, this ability to scavenge does nothing for the quality of the meat of the bird. It is the extra space given to the chicken while it is growing, whether indoors or outdoors, that makes the difference in meat texture. 2. What is the difference between a yellow chicken and a white one? The answer is simple – only the color. It has nothing to do with the quality of meat, its fat content, or how it was raised. It is a marketing tool only. All chickens are naturally white skinned. Depending upon contents of the feed, including the use of corn versus wheat in the feed formula, the resulting color will vary accordingly from pale white to bright yellow and all shades in between. 3. What effect does the use of antibiotics have on chickens? Antibiotics cost the grower money. They are used because they save money in feed costs and reduce mortality. They serve three functions: one, they prevent the spread of disease within flocks; two, they reduce stress having a tranquilizing effect on the birds; three, they make the chicken continually hungry and, therefore, likely to eat more and grow faster than it would without this medication. It takes about 2-3 weeks longer to reach the same weight without antibiotics than with them. 4. What does "All Natural" mean? The USDA's definition pertains only to how the chicken is processed, i.e. 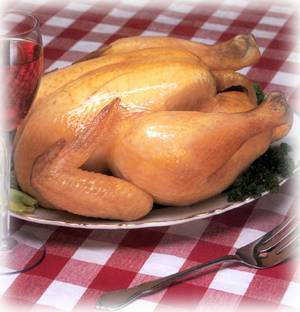 whether any substance, such as a basting additive, is injected into the bird at the processing plant. If nothing is added at the processing level, the "All Natural" claim can be made provided it is qualified with the "Minimally Processed" statement that must accompany it. It has nothing to do with how the bird is raised, what it is fed, or what it is medicated with, as long as no artificial ingredient is administered. 5. What about hormones, preservatives, excess fat claims? It is against the law to administer hormones to any poultry in the USA. Nobody does it. There are no preservatives used on fresh chicken or frozen chicken, and no chicken has excess fat. There are companies in the marketplace that make these misleading claims which infer that those not making the claims contain these undesirable qualities. 6. What qualities differentiate one brand of chicken from another? There may be many. There is a big difference among the many breeds of chickens offered in the marketplace. Numerous companies compete in order to produce the fastest growing, best feed converting, lowest fat, biggest breasted, disease resistant, egg producing strain. Geneticists crossbreed continually in order to produce the perfect chicken. The winner reaps huge rewards, and the latest test flock results are guarded as if they were classified as a national security top-priority matter. However, the best feed converter is not necessarily the best chicken from the consumer's point of view. Most consumers want big-breasted birds. They don't want to see bruises or imperfections. Most have a color preference but don't know why. 7. What's so special about our Natural Chicken? It is much heavier breasted. Its flavor is distinct and noticeably better. In general, it produces less fat when cooked. It contains less absorbed water than those chilled using giant continuous chillers and pre-chillers. You can see the difference in both raw and cooked by way of a side-by-side comparison. Its texture is firmer due to the breed of the bird, the room that the birds have to move around in, and the absence of antibiotics in the feed. 8. Why do they cost more? They cost the grower and processor more to grow, more to process, more to package. They eat more feed, they take longer to grow, require more space within which to grow, and require more labor to oversee their growth. All chickens are vaccinated at the hatchery for Marek's and Newcastle disease. They are subsequently vaccinated for coccidiosis when placed in the grow-out buildings or brooder houses. The vaccines are not antibiotics. The difference is totally in the use (or non-use) of antibiotics as growth enhancers, stress reducers, and disease preventers. Their usage, coupled with the crowded growing conditions and choice of breeds that convert feed better versus breeds that have better breast confirmation and pre-chilling in order to absorb extra water to sell to retailers and their customers, make the biggest differences in quality.